Not unlike much of what I discover on the www, I came across this video while researching something else. I was completely awestruck. 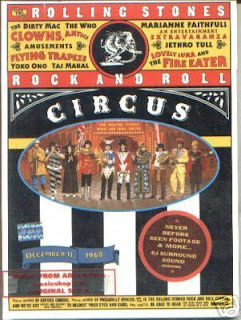 In the late 60s the Rolling Stones undertook an ambitious project - filming a concert against the backdrop of a circus - hence the title "Rock and Roll Circus." But because of their unhappiness with the overall quality of their performance they didn't release it for almost 30 years. It was released on DVD and CD in the late 90s. Here's John Lennon, with his all-star group "Dirty Mac". Keep an eye out for Yoko Ono in a black bag. Some music critics thought this was an excellent use of her talents! The Wikepedia entry on Rock and Roll Circus can be found here.